WASHINGTON, Sept. 29, 2014 - Air power has stymied Islamic State of Iraq and the Levant terrorists, with the Air Force accomplishing 74 percent of the more than 240 airstrikes in Iraq and Syria since Aug. 8, a senior Air Force official told reporters at the Pentagon today. Maj. Gen. Jeff Harrigian, the Air Force's assistant deputy chief of staff for operations, plans and requirements, said airmen are working closely with joint and coalition partners to execute current operations as part of the "persistent and sustained" campaign against the terrorist group. "Air power's targeted actions are disrupting ISIL's command and control, their logistics and infrastructure, and their freedom of movement," Harrigian said. "We see air power as one of the fundamental components of the comprehensive strategy." The general also reported that the Air Force's decisive capabilities have prevented large-scale force massing, have degraded ISIL's command and control capabilities, and will, over time, stanch ISIL's financing, which he acknowledged will require a whole-of-government approach to address. The Air Force has executed some 50 percent of the airstrikes in Syria thus far, and 70 percent of the more than 3,800 total sorties in Iraq and Syria, Harrigian said. The Air Force, he added, also has accomplished 95 percent of the almost 1,300 tanker sorties essential to persistence and range requirements, as well as 700 intelligence, surveillance and reconnaissance sorties in support of the operation. Noting his dual role as Air Force operations deputy to the Joint Chiefs of Staff, Harrigian explained that the Air Force has worked for years to develop airmen across the theater, training them both downrange and in garrison to seamlessly integrate into operations and ensure necessary interoperability. But U.S. air power alone, the general asserted, will not destroy ISIL. "We've been working with our coalition partners and sister services for years to develop the full array of air power capabilities that we're bringing into this fight, leveraging our lessons from both combat and training to execute these current operations," he said. "This broad coalition has been and will continue to be the cornerstone of the strategy against ISIL." The F-22 Raptor fighter jet has been an important part of the effort, the general said, bringing stealth, speed and integrated avionics that facilitate situational awareness for the pilots, planners and joint terminal air controllers. "Ultimately, ... air power offers a broad range of capabilities to the combatant commander, and ultimately, the president," Harrigian said. "Beyond airstrikes, we'll continue to provide ISR, the tankers, command and control platforms and humanitarian assistance as required to meet the enduring and ... emerging requirements that will occur over the course of the operation." 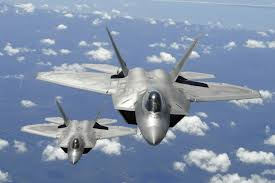 Note: The above DoD photo shows two U.S. Air Force F-22 Raptor fighters.